Wireless – Cisco Meraki M32 Wireless Access Points connected to a MX firewall. 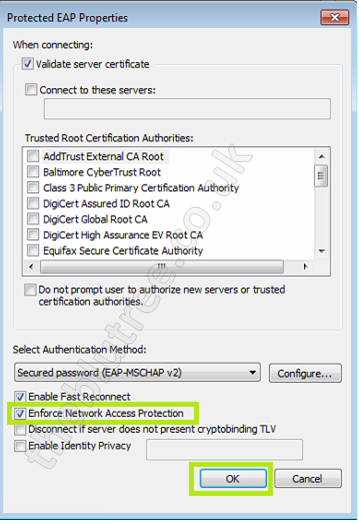 When Clients are connecting to a Wireless network using 802.11 or WPA2 Enterprise they are showing in the event viewer on the radius server as Non-NAP Capable and quarantined. This occurs if the client is not setup correctly causing them to show as Non-NAP Capable. There are a few Settings that need to be enabled on the client and most/all of the settings below can be pushed out by a group policy. 2) As there is a delay when the wireless network connects you need to start the NAP service after the wireless. 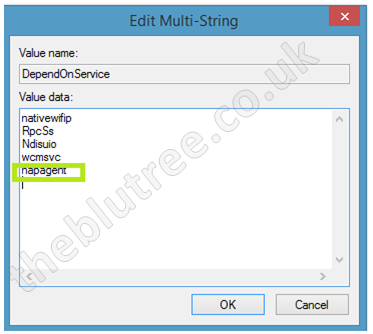 Update the DependOnService entry and add napagent. The entry should look similar to the below. You will need to reboot the client for the registry change to take effect. NOTE: The service WCMSVC below is only required for Windows 8 workstations. Select adaptor settings > Right click the Wireless connection once connected to the wireless connection > Select Status > Wireless Properties > Security Tab > Settings > Select Enforce Network Access Protection > Select OK on all open windows.